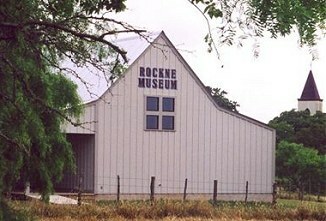 One of the first projects of the Rockne Historical Association (RHA), formed in 1990, was to establish a museum. In 1993, a room in Holtman Hall was designated as the Rockne Museum. Land was acquired and a ground breaking ceremony for the new museum building took place in April 2002. It was completed one year later. Dedication of the Rockne Museum took place on June 14, 2003. The new museum holds hundreds of antiques, artifacts, historical books and papers. Shown are just a few of the items included in the collection. Click on photos (left side & below) to enlarge.